There’s a new sheriff in town… The International Lunar Treaty of 2061 divided a million square miles of the moon between the three cities of North America, and every six months one of the cities has to supply a new Judge-Marshall to enforce lunar law. Step forward Judge Dredd; in this pocket-sized collection of stories from the early days of 2000AD’s leading lawman, it’s his turn, but there’s a long line of lawbreakers ready to get in his way. The first few stories here set up the city of Luna-1 as a Wild West-style town; the rough frontier compared to the metropolis that is Mega-City One. There’s a robot gunslinger, a sinister tycoon buying up land, and a very cool moment where the new sheriff enters a saloon. Yes, of course Dredd ends up in a bar fight. Unfortunately, this intriguing premise is forgotten about not long into the Luna-1 stories, when the tone reverts to the kinds of cases that would work better back in Dredd’s normal setting of the Big Meg. One story sees a gang of evil robot cars go on the rampage, stretching out a joke about a car having the mind of a five year-old child for four whole chapters (and it’s as tedious as that sounds). Those used to the more sophisticated storytelling of recent 2000AD epics may be disappointed; the strips here are short, simple, albeit occasionally fun tales in which a gimmicky villain pops up and Dredd soon comes up with a ploy to beat them. The Luna-1 stories have a nice initial concept but squander it in favour of an inconsistent depiction of their setting and unremarkable storytelling. 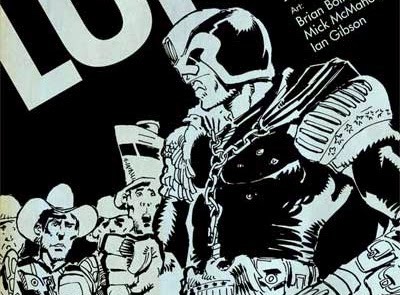 Especially considering their placement in the Dredd chronology near to the much-loved Cursed Earth saga (the first Dredd epic) and The Return of Rico, which added some depth to Old Stony Face, there’s a good reason the Luna-1 stories haven’t been remembered as well as others. With the strips in this volume also available as part of the Complete Case Files, and Dredd’s adventures continuing in 2000AD, there are better options out there to get your fix of justice.